After the fall of the Western half of the Roman Empire, missionaries from the Roman Church spread out everywhere, converting the barbarian kings and their people to Christianity. Many tribes did so, and one of the leading ones were the Franks. However, this conversion was not very sincere; after the death of Clovis, political disorder and killings were rampant, and the pagan sacrifices were carried out as well, as if they (the Franks) had not even been converted to start with. 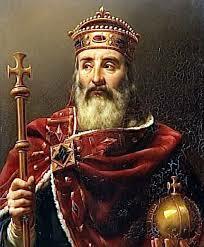 At this time, the Merovingian family was in power over the Franks. An ancient family, they bore a lot of prestige, but their name was tarnished by the killing of one another and the general disorder, and the incompetency of the reigning kings. Because of this, the Carolingian family came into power, taking over the office of Mayor of the Palace, and thus held the power of king without the title. The Kings held no power, and Pepin the Short, as the current Mayor of the Palace, went to Rome, seeking permission beyond that of the Frankish nobility to depose the Merovingian family, and make his family the Royal Family of the Franks. The Bishop of Rome, Zachary, formally deposed Childeric III, the King of the Franks at that time, giving his blessing to Pepin, and this was solidified by Bishop of Rome Stephen II, who crowned him King of the Franks. Pepin the Short then fought the Lombards, a barbarian tribe who had control of Italy, and the land was given to the Bishop of Rome, solidifying the alliance between Chruch and State. Soon after Leo II crowned Charlemagne, the next King, emperor, and the title was then enlarged to Holy Roman Emperor, thus to poorly distinguish it from the ancient Roman Empire. ← Welcome to My School Blog!